Fiction – paperback; Harper Perennial; 192 pages; 1992. “One of the most acclaimed novels of 1991” screams the blurb of this book by acclaimed American writer Ron Hansen. This doesn’t seem much of a recommendation to me, but how else would you market a book about a bunch of nuns living in a convent in upstate New York in 1906? Doesn’t sound like a particularly inspiring sort of story, does it? And yet this sparse, beautifully written novel, is an exquisite, mesmerising read. Open any page and the words are impeccably arranged to read like poetry. Wide milk cows are tearing up green shocks of grass in the pasture. Each chews earnestly, like a slow machine, until the roots disappear in her mouth and she goes back to the grass again. 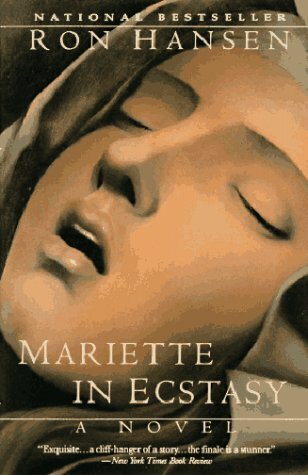 Mariette in Ecstasy is about a 17-year-old girl who joins the Sisters of the Crucifixion, where her much older blood sister is the Reverend Mother. Into this world of extreme religious devotion, Mariette offers a breath of much-needed fresh air. She is young, pretty and full of life. But she is also incredibly devout and believes that she can commune with Jesus to a much higher degree than the other nuns. When Mariette begins to show signs of divine possession and begins bleeding from wounds in her hands, feet and side that resemble the crucifixion wounds of Jesus, the nuns close ranks. Is it a hoax or a miracle? Is Mariette duping them, or is she a saint? I don’t think it’s spoiling the plot to point out that the book poses no answers. Hansen leaves it to the reader to make up their own mind, but this is not to say that the conclusion is unsatisfactory. Indeed, I found it to be incredibly clever — and wise. But the real wisdom (and beauty) of this book is the way that Hansen arranges the story around the religious calendar and the changing seasons. In conveying the minutiae of daily life in a convent, the reader gets a real feel for the tedium and gentle rhythm of the nuns’ existence. Mariette kneels on ginger-brown earth as she plants winter seeds in a hot-weather garden that Sister Saint-Luc has harrowed and Sister Saint-Pierre has grooved with a stick. Brussels sprouts, kale and savory cabbage. Sister Hermance is just behind her with a tin watering can. Sister Saint-Luc sings the hymn ‘Immaculate Mary’ and the sisters join her. Hot breezes slide through the bluejoint grass. Sister Sabine is walking behind a horse-pulled thresher in the barley field. When Sister Hermance pours, she sees the water puddle like hot cocoa, but soon it is just a faint stain in the earth. Killdeer kite down and dally above Mariette, as if suddenly interested. Turtledoves watch from the telephone wire. And Sister Hermance thinks, We will have a bounty. Everything she touches will grow. Dirt puts itself in her hands. But just as you get lulled into the gentle narrative style, a carefully placed paragraph jolts you awake. These startling paragraphs which all take the same form — dialogue between a priest and a succession of various nuns — are never explained. It is only as you get deeper into the novel that you realise they are from an inhouse investigation into Mariette’s stigmata. By juxtaposing these testimonies with the seemingly dull but very strictly ordered day-to-day existence of the sisters, Hansen is able to ratchet up the suspense and create a sense of mystery and intrigue where none would otherwise lay. This “device”, if you could call it such, kept me spellbound, and I raced through this novel in the space of a morning. The blurb might describe Mariette in Ecstasy as one of the best novels to come out of 1991, but I’d argue that it’s one of the best books I’ve ever had the pleasure of reading — and certainly the best one about nuns! The only novel about nuns I’ve read was Lying Awake, Mark Salzman. Have you read that one? This sounds interesting in a quiet sort of way. Interesting read. I wonder how many cloistered orders still exist in the world. Is it based, by any chance, on a historical event? I read Hansen’s ‘The Assassination Of Jesse James By The Coward Robert Ford’ last year and noticed that most of his titles were based on real people. If this isn’t, I could possibly be interested, to see how he is at imagining his own stories. Stewart, as far as I know, it’s completely fictional and not based on any real event. Mind you, I’ve already passed this book onto someone else so I can’t check to make certain. If this is one of the best novels you’ve ever read then I am going to ensure I get hold of a copy. It sounds much more literary than Sacred Hearts by Sarah Dunant and I found her portrayal of nuns fascinating. Thanks for the recommendation!